Scientific Background: The HeLa cell line was originally derived from a human donor's epithelioid carcinoma tissue (cervix). Research into the heat shock response provides a model for studying the effects of environmental and homeostatic stressors upon cells. Heat shocking reproducibly alters gene expression in cells, resulting in various morphological changes and the expression of heat shock proteins crucial for both maintaining cellular homeostasis during normal cell growth and for survival during and after various cellular stresses. Heat shocking increases morphological changes compatible with apoptosis in many cell types. In mammalian cells, the induction of the heat shock response requires the activation and nuclear translocation of transcription factors which control the expression of cytoprotective heat shock proteins, and play pivotal roles in the development of inflammation and immunity. 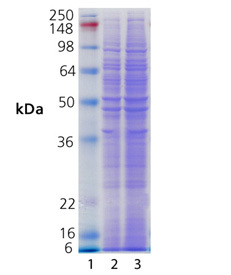 SDS-Page Analysis: Lane 1: MW marker; Lane 2: HeLa cell lysate heat shocked (10µg); and Lane 3: HeLa cell lysate heat shocked (20µg). 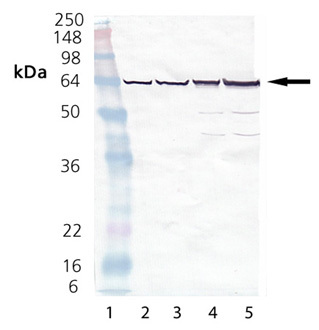 Western blot analysis: Lane 1: MW marker; Lane 2: HeLa cell lysate control (10µg); Lane 3: HeLa cell lysate control (20µg); Lane 4: HeLa cell lysate heat shocked (10µg); and Lane 5: HeLa cell lysate heat shocked (20µg).